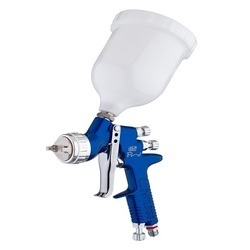 A totally new DeVilbiss spray gun developed for busy professional painters needing the ultimate in quality finishes. 1.1mm to 2.0mm High Quality Stainless steel nozzle and niddle with Conventional and Trans Tech Technology for batter economy, Ergonomic design for less operator's futigue. Alluminium body with tough electro pletting coat. In order to meet excellent quality standards, we are supplying Devilbiss Paint Spraying Hand Guns. The Compact, HVLP (Blue) Pressure Gun is built to provide outstanding coating atomization. It maintains EPA compliance to produce a superb finish. The Compact Gravity Feed, HVLP (Blue) Pressure Gun with 1 Liter Cup is built to provide outstanding coating atomization. We are amongst the most reputed names in the industry, offering Devilbiss Spray Guns. We are engaged in offering Devilbiss Paint Spray Gun. Our company has been successful in winning appreciation from the clients as one of the most prominent names in the trading of Devilbiss Paint Spray Gun. Banking on our enriched industry experience, we are able to supply Devilbiss Spray Guns.